Now in this tutorial, we are building a program to Send Data to Web using Arduino and Wi-Fi module. For this we first need an IP address of either Global or Local server, here for the ease and demonstration purpose, we are using Local Server. 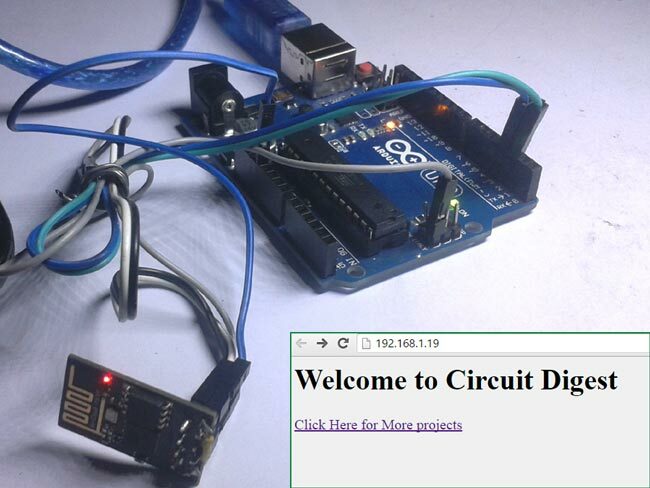 Circuit Diagram for “Post Data from Arduino to Web” is given below. We mainly need a Arduino and ESP8266 Wi-Fi module. ESP8266’s Vcc and GND pins are directly connected to 3.3V and GND of Arduino and CH_PD is also connected with 3.3V. Tx and Rx pins of ESP8266 are directly connected to pin 2 and 3 of Arduino. Software Serial Library is used to allow serial communication on pin 2 and 3 of Arduino. We have already covered the Interfacing of ESP8266 Wi-Fi module to Arduino in detail. By using Software Serial Library here, we have allowed serial communication on pin 2 and 3, and made them Rx and Tx respectively. By default Pin 0 and 1 of Arduino are used for serial communication but by using SoftwareSerial library, we can allow serial communication on other digital pins of the Arduino. Note: To watch the response of ESP8266 on serial monitor, please open Serial Monitor of Arduino IDE. 1. First we need to test the Wi-Fi module by sending AT command, it will revert back a response containing OK.
4. After that, user can Reset the module with AT+RST command. This step is optional. It will return an IP Address. 8. Now configure ESP8266 as server by using AT+CIPSERVER=1,port_no (port may be 80). Now your Wi-Fi is ready. Here ‘1’ is used to create the server and ‘0’ to delete the server. Now data has been transmitted to local server. 12. Now type IP Address in Address Bar in web browser and hit enter. Now user can see transmitted data on webpage. Check the Video below for complete process. 1. Include SoftwareSerial Library for allow serial communication on PIN 2 & 3 and declare some variables and strings. 2. After this, we have to define some functions for performing our desired tasks. In Setup() function, we initialise inbuilt serial UART communication for ESP8266 as client.begin(9600); at the baud rate of 9600. 3. In wifi_init() function, we initialize the wifi module by sending some commands like reset, set mode, connect to router, configure connection etc. These commands have also been explained above in description part. 4. In connect_wifi() function, we send commands data to ESP8266 and then read response from ESP8266 Wi-Fi module. 5. sendwebdata( ) function is used for sending data to Local Server or Webpage. 6. void send() function is used for sending data strings to sendwebdata() function. That will be further sent to webpage. 7. get_ip() function is used for getting IP address of Local created server. 8. In void loop() function, we send instruction to user for refreshing the page and check whether the server is connected of not. When user refresh or request the webpage, data automatically transmitted to the same IP address. We can display any data from Arduino to Webpage using this process, like Room Temperature & Humidity, Clock time, GPS coordinates, Heart beat Rate etc. You have written a very detailed and a well explained steps for this tutorial. I have used exactly the same wifi module and done same wring as shown in your tutorial. But i am gettin zero as return for client.available() function. Due to this my ESP8622 is not getitng connected to Wifi. Please suggest what could be the issue ...i can see the output properly on the Serial Monitor for Serial.println ...not sure if client.println is working fine. I get upto AT+CIPSEND,0,5 and I get an error LINK NOT VALID - please help? I followed each step very carefully. I am using ESPLORER to send commands. I tried with PUTTY same story. Try placing 'equal to' sign (=) after AT+CIPSEND. What is the "id" in the AT+CIPSEND =id, length of data command. I have tried the port number (80), the IP address as well as a generic 0, none of them seemed to work. Arduino: 1.6.11 Hourly Build 2016/08/09 03:34 (Windows 7), Board: "Arduino/Genuino Uno"
I am facing the same problem.How do you solved it? The problem should be with your ESP8266 module. Try changing the module or resetting it. unable to find string literal operator 'operator""http' "
I don't believe I was able to get this to work! Fifteen minutes ago it seemed hopeless. First of all thanks to Andrei (above) for finding the problem with the http string! One of the things I did (as suggested by some other article) was to use a series of resistors to reduce the TX voltage of the Arduino from 5 v down to about 2.7 v. This probably is not what fixed the problem, but should allow the ESP to live longer. Now, I get the proper "OK" return from the ESP, and eventually my router assigns an IP address. The Arduino console window reports the IP as 192.068.0.78, but that is wrong because my network is 192.168.0.x . I looked in my router setup screen and it assigns an IP to "ES" as 192.168.0.78. Trying to open that page in a broswer initially gave an error, but after refreshing a few times, the webpage data from the code appeared. what changes i need to do in order to send an http get request ? i need to get some json data from a remote website..
is there any chance to do this with this set of code? Yes, in fact the ESP8266 can be programmed using the Arduino IDE, you can dump the UNO; it has a whole wifi library and use the Arduino library to handle the Json returned from a Get request; just google "ESP8266 Arduino IDE"
Kindly tell the command to replace SoftwareSerial client(2,3); //RX, TX line as it shows the error "class WiFiClient' has no member named 'begin'" on compilation. How to Use arduino nano in this Tutorial? I follow all the steps in the video, unfortunately, I cannot open the IP on the webpage. The webpage shows information as below. I try to use what is my IP but I got a different result, my IP on what is my IP is 183.78.56.210 and IP get by Arduino is 192.178.1.1911.
all error will be fix once you use 115200 instead of 9600 and remove pre double quotes from http:. How can i get my personal ip address to mention in my program, and one more thing how to send message in this program.please guide me regarding these two issues. I want to be able to send a message from my arduino uno to my friend's PC through wi-fi. Can you please tell me how I can do this and what on my friend's PC has to be running in order to see the message that I sent? can i send a data from the arduino, to a website that i created and hosted? Same problem as Ross and John R. Used solution given by Anand and John S. but get the result as Rss and John R. Can anyone suggest what next to check? Any help much appreciated. and it connects to wifi but does not returns IP address. I am working on Arduino uno and ESP8285. I don't get my IP Address.